These Honey Roasted Almonds should come with a warning label. They are really addicting. Who doesn’t like roasted nuts? Add in some honey and salt and you have yourself a delicious combination! 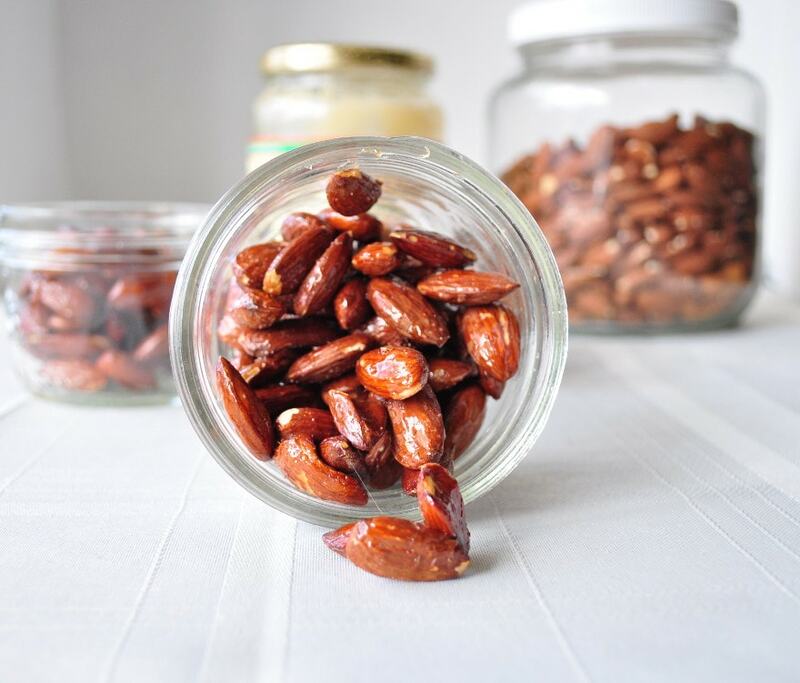 These Honey Roasted Almonds are perfect for snacking! These would probably make a great gift as well. They have a sweet salty taste that reminds me of kettle corn. I LOVE kettle corn! Probably why I could not keep my hands off yummy roasted nuts. They are perfect for that time of day that you need something sweet, but do not want to grab a candy bar. They also take only minutes to make. If you like these, then you will probably love my Candied Pecans as well. If you want to keep these totally vegan, you can use maple syrup instead of honey. That works great as well. If you are a visual person, I created this video to show you how to make this recipe. For more videos, you can subscribe to my You Tube Channel. Place the almonds in a bowl. Warm the honey just so it liquefies and pour it over the almonds. Mix well so that all the almonds are covered well. Spread the almond/honey mixture onto a parchment lined baking pan. Sprinkle sea salt over the top. Bake for around 15-25 minutes shaking the almonds every few minutes to prevent burning one side. That is it. Easy. Oh yay! Glad you liked it Jen! These look absolutely amazing, a quick question thought, could you store these? Or would they not keep? Thank you! Yes they should keep for at least a week and maybe more. I store them in a glass mason jar. Just wait until they are completely cooled to store them. I also break apart any nuts that are stuck together before I store them. Just made these, do they “dry” as they cool so they are not so sticky? Mine are still as if coated with wet honey! They are yummy tho! I'm sorry they got burned. :( I have burned them once myself. I have an electric oven. Maybe that makes a difference? I think your oven was set too high. The recipe says to bake @ 350. I think the recipe says 350. I made these tonight, subbing cinnamon for salt. The smell when they were in the oven was heavenly! I set the timer for 5 minute increments (after reading other posts) and stirred in between, eventually taking them out after 20 minutes. Probably should have taken them out after 15...but the crunch is perfect and I don't mind a little burnt-y taste :) I'll definitely be making these again!! I tried these today, and I was careful to watch the progress while they cooked after reading the previous comments. Took mine out after 16 minutes, because the honey was starting to burn. I used the middle rack and checked the temperature with an oven thermometer. I think maybe 325 might be a better temperature. That way, the honey can caramelize without burning. Going to use less honey next time, too. There was enough glaze to coat the paper and stick all of the nuts together, which made tossing the nuts during cooking more difficult. I would like to see you do this on video, so I could compare our results. I tried this recipe and it turned out to be awesome. Please check my recipe at https://sonlicious.com/recipe/honey-glazed-almonds/ and share your feedback. I have also added a calorie chart that you might like to share in your recipe. Let me know if you would.